Please refer to our stock # 11537 when inquiring. This stunning vintage bracelet is 1 1/2" wide and has a 2 1/2" diameter opening. 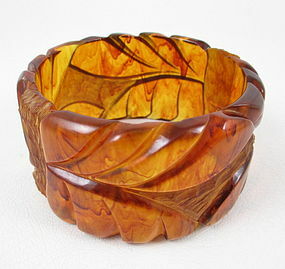 It is hand crafted from tortoise bakelite and has a detailed leaf design in both polished and matte bakelite. It has been tested and it is in excellent condition.